In July and August, knowledgeable WHOI volunteers guide visitors on free walking tours through the WHOI dock area and other restricted village facilities. 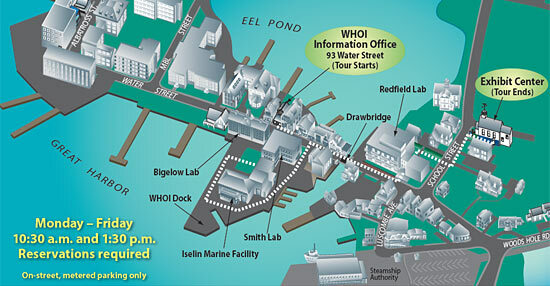 Launched from the WHOI Visitor Center at 93 Water Street in the center of Woods Hole village, the tours take approximately one hour and fifteen minutes and provide background on the research conducted at WHOI and on the history of the Institution. Tours are available, Monday through Friday at 10:30 a.m. and again at 1:30 p.m. Space is limited, so see below to register for a tour. Call (508) 289-2252 or email information@whoi.edu for more information. Tours are recommended for a teenage to an adult audience. PLEASE NOTE: Due to the high volume of visitors during the summer months, we cannot accommodate any special groups beyond our regularly scheduled tours (10:30 a.m. & 1:30 p.m.). A limited number of special group tours, for ten or more people, may be arranged from September - June, Monday - Friday. Knowledgeable WHOI volunteers guide groups on free walking tours through the WHOI dock area and other restricted village facilities. These tours are recommended for a teenage to an adult audience. If you are interesting in booking a tour for your group, please call the WHOI Information Office at (508) 289-2252 or email info@whoi.edu.